The Type 4 Ho-Ro is a rank I Japanese tank destroyer with a battle rating of 1.7 (AB/RB/SB). It was introduced in Update 1.65 "Way of the Samurai" along with the rest of the Japanese Ground Forces Tree. The vehicle, known by its full designation as the Imperial Japanese Army Type 4 15cm self-propelled gun Ho-Ro (Original Text: 日本語: 四式十五糎自走砲 ホロ), is a open-topped SPG with a short-barreled 150mm howitzer, based on the Chi Ha chassis and running gear. The name "Ho-Ro" translates roughly to Gun Two, or more properly, Self Propelled Gun Number 2. 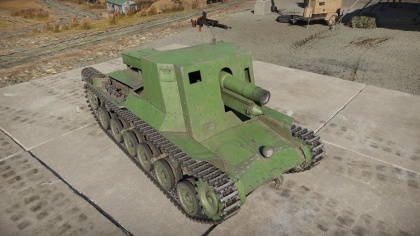 Since its introduction into War Thunder, the Ho-Ro has gained a reputation for being one of the most powerful howitzer-equipped SPGs in the game despite its reserve battle-rating, right up there with the beloved KV-2. It is capable of destroying or severely disabling any opponent it meets (or more often ambushes), even against vehicles in Rank V. This is mainly due to its extremely effective High-Explosive shell, however this is balanced by the shell's low velocity, in which the player must literally lob the shell in a arc at their opponent even for a short distance, and the vehicle's generally light armour and limited gun traverse compared to other SPGs. The Ho-Ro a is fairly maneuverable SPG, and like many other open-topped vehicles, this is not one that should charge into the front-lines. 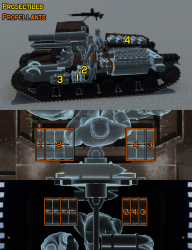 Just like many of the other low-rank Japanese vehicles, it has no real armour protection from anything more than rifle-caliber MGs, and its ammo storage is literally a box mounted on top of the engine deck. The crew is very exposed, and the gun breech is mounted rather high on the chassis and can be easily knocked out. With this knowledge in mind, the Ho-Ro is best played by staying in the rear (but not distantly) of friendly tanks as short-range or point-blank artillery fire, along with finding hidden positions where it can attempt to be hull-down out of sight of the enemy. Due to its low-velocity shell, the gun often needs to be aimed higher than the commander estimates when performing direct-fire onto a target, but this also allows the vehicle to lob shells from behind shallow hills, out of the sight from opponents that may be camping or pushing into friendly territory on the other side. Note however that because its HE shell is so powerful, it is extremely risky to fire directly next or very close to an enemy vehicle, as the light armour may not protect the crew, and the blast from the shell's explosion it will certainly deal damage to the vehicle itself. The gun, while powerful, cannot traverse very far to either side and its depression is actually depressing (-5°), so in order to fire on tanks that are outside of the arc of the gun's horizontal traverse or down a hill-side, the entire hull must be traversed as well. The recoil of the gun is also an issue, as it throws the vehicle backwards rather severely (just like the M-56 Scorpion), which means it loses target acquisition every time it fires. One interesting note is the pintle-mounted MG on the roof, which has good elevation and a much wider range of horizontal fire than the main gun, which can be useful on spotting enemy tanks for team-mates or dealing with SPAAs that have exposed gun-crews. However, it has a slower rate of fire than most other rifle-caliber MGs and its magazine capacity is pitiful. 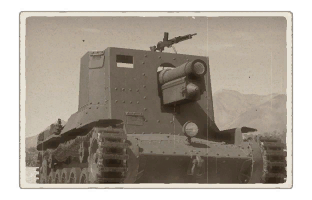 In conclusion, the Ho-Ro is a very defensive vehicle suited to supporting friendly tanks and ambushing the enemy on paths were they may attempt to flank around the map. 150 mm howitzer makes it an intimidating foe, largest caliber gun in Rank I .
Howitzer's round trajectory makes it able to fire over hills. HE load can cause sufficient splash and shrapnel damage even if the shell doesn't directly hit the target. Can destroy most, if not all, vehicles by shooting HE just under an enemy tank and hitting the thim belly armour. Can deter inattentive flak trucks or any vehicles with open and exposed crew with its roof-mounted MG.
Quick, maneuverable in both AB and RB, though slightly sluggish to put into gear in the latter. Super thin armour, extremely vulnerable to heavy machine guns, SPAAs, and aircraft. Extreme blast radius can destroy the vehicle if fired too close to oneself. Ammo Rack is literally a box behind the crew on top of the engine deck, leading to some very explosive ends if hit there. Massive recoil causes the vehicle to be launched backwards after firing, requiring aiming adjustment after every shot. Very slow muzzle velocity and limited range. At long range, the shells have a habit of bouncing harmlessly off armour surfaces without exploding. AP Shell lacking in penetration for the caliber, relies more on HE power. Skin and Camouflages for the Ho-Ro in Warthunder Live.